EH&S Assistant’s latest feature gives you access to everything you need to know about your buildings and labs at your fingertips. Once you’ve added a room and assigned it to a building in EH&S Assistant, you can easily create a map using our new lab sketching tool. The interactive floor map gives you a clean, visual representation of every room and building, and all of the information about those rooms, (responsible parties, inspection history, satellite accumulation, RAM, CHEM and BIO inventory, fire hazards, lab notes, equipment etc.) is just a couple of clicks of the mouse away. 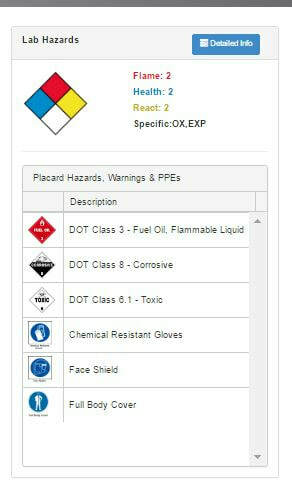 Clicking on any link in the overhead view displays a quick listing of the hazards present as they appear on the door placard. ​Clicking on the "Detailed Info" button at the top of the hazard listing brings up all of the information that the EH&S Assistant has stored about that lab.